Council President Ernie Moscoso joined City Council Member Paul Krekorian to turn on the new traffic signal at the intersection of Lankershim and Valerio. As a popular pedestrian crossing, this intersection has long been a dangerous place to walk or drive, but that all changed on November 5th. 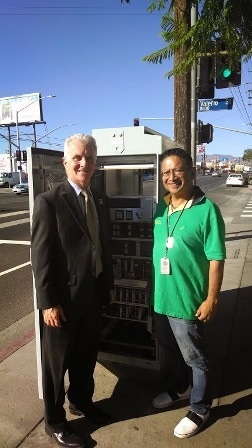 President Moscoso and Councilman Krekorian at the control box for the new signal at Valerio and Lankershim.